 Whether it is hidden behind an IP address that the Smoothwall System owns (see Allocating IP Addresses to Interfaces ). This is source Network Address Translation (NAT).  Which external interface it uses. Source NAT-ing is needed when accessing the Internet. It can either by done by the Smoothwall System, or by another device between the Smoothwall System and the Internet such as the gateway, or both. Typically, source NAT-ing is carried out by the gateway. You can also specify the gateway device to direct traffic to, or a link load balancing (LLB) pool of external connections to use, including a default LLB pool to use. For a detailed description of load balancing external connections, see Load Balancing Traffic . You can choose to have local traffic, that is, traffic for installed services such as Guardian (see About Guardian)or Anti-Spam (see About Anti-Spam ), use a load balancing pool. 1. Go to Network > Configuration > Source NAT & LLB policies. 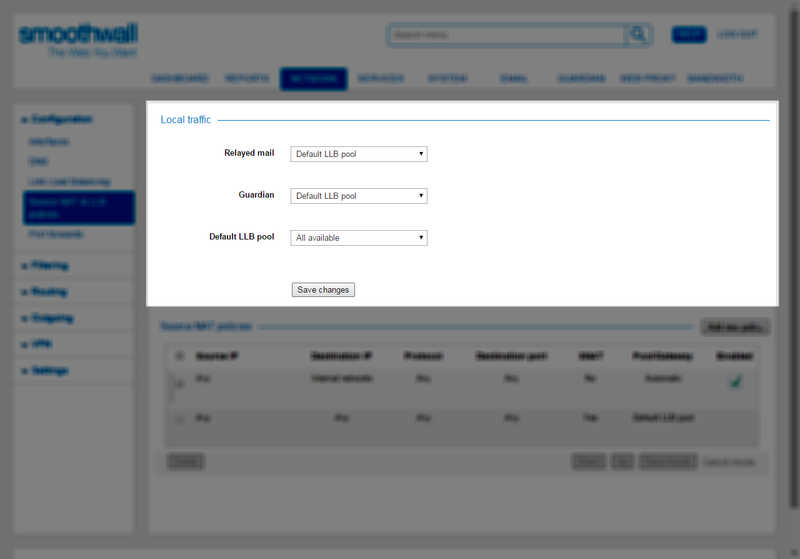 The Smoothwall System provides a drop-down list for every service that can be load balanced. 2. You must first configure the connections for the Default LLB pool to use. Scroll down to the Local traffic panel. 3. From the Default LLB pool drop-down list, select the relevant external connection. 4. Use the drop-down lists for the relevant services to choose the appropriate load balancing pool to use. Note: If IP address spoofing is enabled for any Guardian authentication policy (see Creating Authentication Policies), the LLB pool configured here is not applied to local spoofed traffic as it is not seen as coming from Guardian. Upon installation, the Smoothwall System defines a policy for each gateway configured, and an Automatic “catch-all” policy for internal networks. Note: If the Smoothwall System is configured to use a single gateway, additional source NAT policies are not required beyond the predefined rules. If more than one gateway is used, you must ensure each gateway is assigned to a policy. 2. Click Add new policy. • Status — New policies are enabled by default. Clear the check box to create a disabled policy. • Source IP — Choose whether this policy applies to all source IP addresses (Any), or from a specific list. To apply this policy to a specific source IP address, or range of IP addresses, select User defined. Either enter the source IP addresses, address range, or subnet ranges individually in the box provided, or click the down arrow and select the relevant IP addresses, or ranges. Optionally, select Save selected objects as group to create a new address object that can be re-used in other areas of the Smoothwall System’s user interface without re-entering each individual IP address, or address range. For more information about using address objects see Working with Address Objects . • Destination IP — Choose whether this policy applies to all destination IP addresses (Any), or from a specific list. To apply this policy to a specific destination IP address, or range of IP addresses, select User defined. Either enter the destination IP addresses, address range, or subnet ranges individually in the box provided, or click the down arrow and select the relevant IP addresses, or ranges. Optionally, select Save selected objects as group to create a new address object that can be re-used in other areas of the Smoothwall System’s user interface without re-entering each individual IP address, or address range. For more information about using address objects, see Working with Address Objects . • Protocol — Choose Any for all protocols, or from the drop-down list, choose the relevant protocol that applies to this policy. Valid values are: Any, UDP, TCP, TCP&UDP, ICMP, GRE, ESP, AH. • Destination port — Rules for TCP or UDP protocols can also be restricted to specific destination ports. Choose whether this policy applies to all destination ports (Any), or from a specific port. To apply this policy to a specific port, either select it from the Predefined drop-down list, or enter it into the User defined box. Note that you can specify a range of ports using the format: lowest_port_number:highest_port_number. • SNAT — Choose whether to hide the source IP address of the network client behind the external IP address of the Smoothwall System (SNAT using a Link Load Balancing pool), or not hide it (Preserve the original source IP). From the drop-down list, select the relevant pool for this policy. From the drop-down list, select the Gateway to route traffic to. If you have more than one gateway configured, do not select Automatic. • Comment — Configure an optional comment for this policy. An additional button, Show comments, appears on the Source NAT policies table if any comments are configured. Clicking this displays configured comments under the source IP address. 2. From the Source NAT policies table, highlight the policy, and click Edit. 3. Edit the configuration as required. 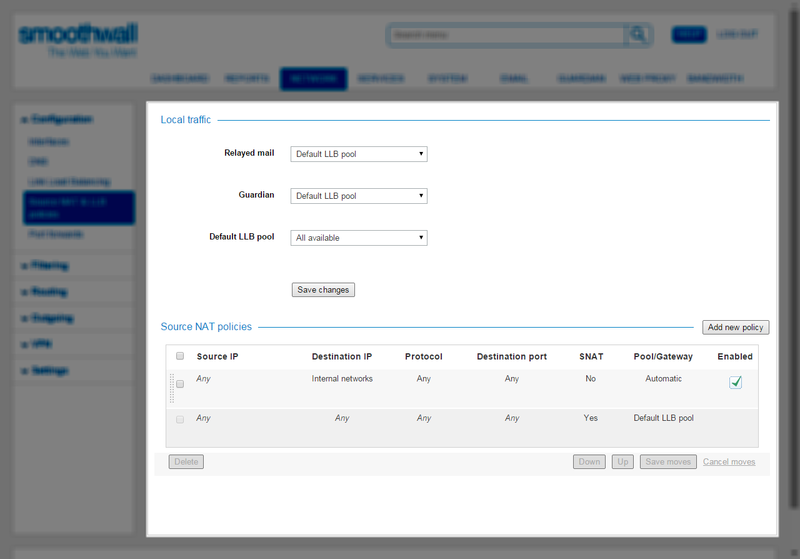 For a detailed description of each setting, see Creating a NAT Policy . 2. From the Source NAT policies table, locate and highlight the relevant policy. 2. From the Source NAT policies table, mark each policy for deletion by selecting the check box to the left of Source IP. The Smoothwall System applies source NAT policies in the order they are listed in the Source NAT policies table. Note: Once Save moves is clicked, you cannot undo the changes by clicking Cancel moves.